15364.81 Charlotte Maria 7 BIGELOW, dau of John 6 ( Jason 5 , Jason 4, Samuel 3, Samuel 2, John 1) and Betsy (MAYNARD) BIGELOW, was born at North Brookfield, Worcester, MA on 06 May 1816. Her marriage was to Apollos Wellington on 14 May 1835. Bigelow Society had no data on him, but web site below had : (Appollos Wellington b 11 June 1812; d. _ July 1893 Monson, Hampden co, MA) . Charlotte died at West Brookfield on 17 August 1876. 15364.811 Nancy Maria Wellington, b 04 June 1836; m Oliver Woodbridge. 15364.814 Maria Elizabeth Wellington, b 20 Feb 1843; m Charles McMasters of Monson. 15364.815 Julia Amanda Wellington, b 21 March 1845; m Charles F. Sampson. 15364.816 Charles Sumner Wellington, b 16 June 1847. Photo courtesy of John Banks. Justus Collins Wellington was born on 13 Jan 1838 at North Brookfield, Worcester County, Massachusetts, son of Appollos Wellington and Charlotte Maria Bigelow, grandson of Eli and Margery Wellington, also of John and Betsey (Maynard) Bigelow. child not named, 3/12 (f). At the time of his enlistment in the 15th Massachusetts Volunteer Infantry, in 1861, Justus gave his occupation as shoemaker. On 12 Jul 1861 Justus mustered into service with the 15th Massachusetts Volunteer Infantry, being credited to the quota of West Brookfield, Worcester County, Massachusetts. He was 23 years, 5 months and 29 days old. Justus was sending his army earnings home to support the family, according to his pension file. On 21 Oct 1861, at The Battle of Ball's Bluff, Leesburg, Virginia, Justus was among those who swam the river. According to a general affidavit from his sister, Nancy, in the pension file: "...he had some money ready to send before the battle but lost everything (as he) swam the Potomac to save his life." He died on 17 Sep 1862 at The Battle of Antietam, Washington County, Maryland, killed in action. He was 24 years, 8 months and 4 days old. In Nov 1862 Appollos Wellington applied for a pension to surviving family member, based on Justus's service; and again in May 1869. These applications appear to have been denied. 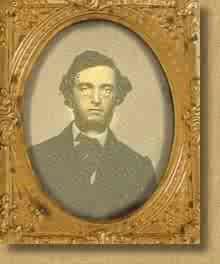 John Gardner Wellington, his brother, survived Justus Collins Wellington and died of consumption on 11 Jul 1866 at age 24. After this son died, the next day the mother became ill and was "bed-ridden 10 years and sick until her death in 1876," according to an affidavit in the pension file. Charlotte Maria Bigelow, his mother, survived Justus Collins Wellington and died on 17 Aug 1876 at West Brookfield, Worcester County, Massachusetts, at age 60. On 17 Aug 1886 Appollos Wellington received a pension to surviving family member, Massachusetts based on Justus's service; his father, who received certificate no. 233216. Apollos Wellington apparently was not well during and after the war. The following quotation is from the Physician's Affidavit in the pension file from his physician, George Forbes: "In 1862, I remember Appollos Wellington as a weak, nervous man with constant pain in the side and back and trouble with his kidneys. From above causes, he was unable at that time to perform manual labor and was supported by his son, Justus C., prior to and during the war. I have seen and known, personally and professionally, Appollos Wellington, and have prescribed for the above troubles several times each year since 1862 and know he has been unable each year since 1862 to perform manual labor sufficiently to maintain himself and has been obliged to subsist upon charity. And now, July 1887, he is a poor, broken down old man wholly unable to support himself." Several affidavits state Appollos never made more than $200 a year. Appollos Wellington, his father, survived Justus Collins Wellington and died in Jul 1893 at Monson, Hampden County, Massachusetts, having lived there since 1880 at age 81.